As we get ready for the annual all hands meeting and board elections, I want to take time to consider our accomplishments this past year. Below are the goals the board set for the year in priority order along with a short commentary about our progress toward the goal. Allison has been posting a newsletter almost every month since January 2017. Gianna Caputo, our summer intern generated the August newsletter. The newsletter typically features a member profile, a blog post, announcements, sometimes a features section, and a list of kudos. How you can help: We’re always looking for members to write features or blog posts. We wanted to create a healthy, clean, bright, flexible space that would be inviting and functional to new and existing members alike. The front room was reconfigured with improved lighting, the couch moved to the front wall, coat hooks and a spot to drop backpacks near the entry, and a bulletin board and a sign-in station for visitors near the door. How you can help: The committee to improve the space has a list of improvements to be implemented. Talk with Elliot if you want to spend time on this. We went from having few and irregular staffing hours to having staffing every weekday evening from 7-midnight, and weekend hours during the day. Laurence was instrumental in recruiting volunteer staffers and organizing the staffing schedule. Sarah has taken over as the staffing coordinator. How you can help: Sarah is looking to fill several gaps in the schedule and would love members to sign up. We’re also looking to formalize the staffing role somewhat. Next year: There are a number of proposals to be considered in the next few months, most importantly one that would provide all members with keys, that will dramatically change the role of the staff. They will be posted to the membership for feedback, please let us know what you think. This was initially conceived as a photo directory of the members and their interests. Our intent was to make it easier for new members to find people who shared their interests and might be able to help them learn techniques. Instead of the photo board, we’ve focused on creating member profiles in the newsletter and have posted the volunteer staffer’s interests alongside their schedules. Xanthe is sending welcoming emails to all new members. We’re hiring a bookkeeper who will help manage the membership and email lists. How you can help: Welcome new members, ask about their interests and help them find people who share those interests. The goal was to inventory, maintain, and purchase appropriate tools for the maker space. The most visible effort was the cleaning up and rationalization of the storage space behind the machine room lead by Lee. There have also been a number of tool cleanup efforts in the machine room and the tools are much better organized. Building Community donated a large number of tools with the tool trailer along with bins to hold them. There were several work days to cull and organized those tools. Jeff Busche provided us with a chop saw via a long term loan, and built stands for several tools, most notably the drill press. The board ratified a purchasing procedure and budget so it’s easier to make note of and acquire materials needed to maintain our tools. Buddha & Jen evaluated the market and recommended the “Original Prusa i3 MK2 Kit” which we purchased and assembled. It got VERY heavy use for most of the winter, and Thursday staffing hours were dedicated to 3-d printing. Starting in the spring it has had maintenance issues and much less activity. How you can help: This is an area that could use some leadership. There are 4 printers at the IG, all in need of repair at some level or another (or replacement). There is a great deal of interest in 3-d printing when the machines work. 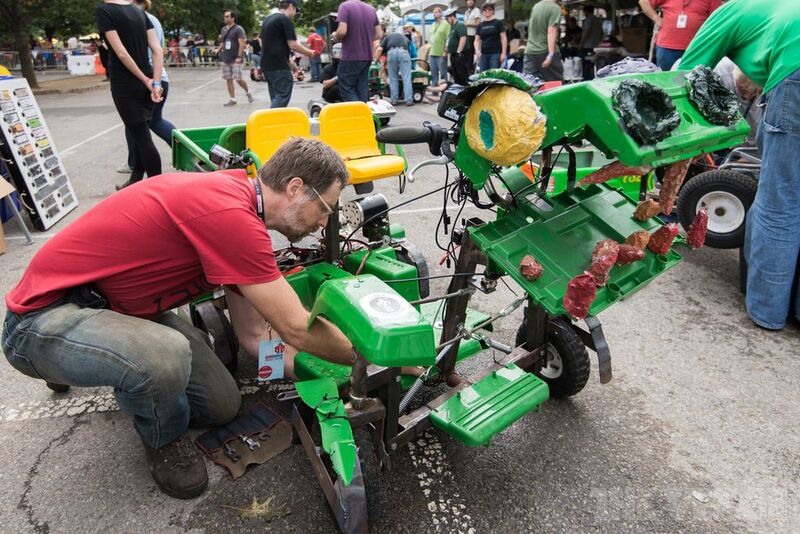 The Generator has had a history of developing collaborative projects, including the electric dragon racer that got second in the Power Racing “Nationals” at the 2013 New York Maker Faire. We weren’t the fastest but we got by far the most Moxy Points. These projects provide an opportunity for people to work together, learn new skills and do bigger projects than an individual could complete. Laurence started a bike club that was active for several months until RIBS restarted and drew many of the attendees. How you can help: All the collaborative activities we’ve done in the past were lead by an individual with a vision. If you have an idea, talk it up, write about it in the newsletter, develop a plan, get people to commit to it, and host build days. It’s a reasonable amount of work, but it is really rewarding for the members who get involved. There was a desire to upgrade the content on the website. Some effort was put into removing out of date material this year. There have been half a dozen blog posts and the calendar has been maintained and updated. How you can help: Out web and social media presence could use some love. If you have the skills and interest, talk to Allison or one of the officers to get access and discuss your plans. There was a desire to purchase additional tools like the laser cutter that are expensive, unusual tools people can’t purchase on their own. How you can help: Join the discussion about the large tool purchases. Help set up the clay studio. In January, we acquired rights to use the space to the back of the machine room all the way to the front of the building. This is a lot of space, but it needs to be upgraded to be useful. Laurence set up a bike working area and we’ve started setting up a clay studio and Caleb is coordinating firings once a week. There is movement afoot to add outlets and a slop sink. How you can help: There is a LOT going on in this area. Expansion into this area and possibly beyond will be a big focus for the board in the coming year. Talk with Elliot and help out. This wasn’t identified as an independent priority, but the staffing hours and newsletter both help with this. Elliot is acting as the liaison for new members. Instead we’re focusing on training members.